One of the great achievements in the genre of liturgical drama is the so-called Ludus Danielis (.PDF file), the Play of Daniel, one of the plays known to have been performed at the Cathedral of Beauvais in the 13th century. The music was notated in a manuscript, Egerton MS 2615, now in the British Museum in London, generally dated to the early 13th century, probably between 1227 and 1234. That is around the time at which the bishop of Beauvais undertook the building of a new, but ultimately ill-fated Gothic cathedral to replace his Romanesque one, which had suffered a series of fires. Plans to give Beauvais the highest Gothic vault in Europe proved disastrous, as repeated collapses of the structure halted the building process shortly after the choir was completed. In any case, performances of the Ludus Danielis probably took place first in the old cathedral, now known as Notre-Dame-de-la-Basse-Œuvre, parts of which are still standing on the site where the new enormous nave was planned. No other work of the period moves with such directness and energy. Even in its time it must have seemed extravagant, not least musically. Little of the liturgical spirit informs it, although it ends with Te Deum. It stands at the opposite end of the scale from the Peregrinus ceremonies, with their copious use of biblical and liturgical material. It seems to have had no successors, and indeed, the composition of new dramatic liturgical ceremonies of any kind fell off rapidly after the thirteenth century (p. 273). The work has been recorded with incredible frequency, by the Harp Consort, the Clemencic Consort, Schola Hungarica, Ensemble Venance Fortunat, Hortus Musicus, and several others. 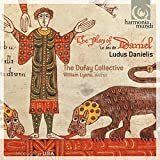 This new recording by the Dufay Collective reflects the oh-so-quirky style of that early music ensemble, which has really created a modern adaptation of the work rather than a historically minded recreation. In Egerton 2615, the music is notated monophonically and for voice alone (see this image of the play's first folio in the manuscript), meaning that the accompaniment of drones and other instrumental parts is the invention of the Dufay Collective. (Their director, William Lyons, has stated that those parts were created "during rehearsal, and the element of improvisation was constant.") While these parts are fanciful in many details, there is textual justification: in the Latin text, the singers refer to the sounds of strings, drums, harps in polyphony joining with the voices. How to transcribe the vocal parts rhythmically is, as always, fraught with interpretative difficulties, especially in the rhymed passages like "Astra tenenti." Lyons writes in his liner notes that "the transcription of the music allowed both rhythmic and free interpretations but the basic rule established was that all choruses were rhythmic, and all solos unmeasured. This allowed for dramatic declamation in the solo sections, and for a strong processional impetus to the conductus." There is no real evidence to support it, but the sound of the grouop's exultant voices, propelled by strong rhythm, is compelling, as are the occasional vocal harmonies they add to the texture. The singers appear to leave out or elide over some of the notes in the manuscript, as if it were the basis for a quasi-improvisatory performance. Another strange quality of this recording is that the pronunciation appears to be an attempt to make the Latin closer to French, leaving out most final consonants and using French vowels. As parts of the play are macaronic, mixing Latin with Old French, giving the Beauvais play a broad, nonclerical appeal, this makes some sense. The group uses some strange, rather modern instrumental effects to underscore the more mystical moments of the story, such as playing behind the bridge on the strings for the mystical hand "writing on the wall" and clashing dissonance in the instrumental improvisation describing Daniel's private worship of God in his house, which leads to his downfall. To introduce a moment in the second half of play, when the false counsellors are themselves thrown to the lions, the instruments play an (unintentional?) quoptation of the first part of the Dies Irae sequence (this piece is actually one of the rare quotations of pre-existing chant in the play, the responsory Merito hec patimur). The feast of St. Daniel was celebrated on July 21 in the Catholic calendar, but the play was most certainly associated with the so-called Feast of Fools, a time at the end of the calendar year when the subdeacons and young people took over many cathedrals (from December 30 to January 1 -- references in the play to Christmas, in the conductus for Daniel of the Darius half, for example, confirm this). The voices used were presumably all male, something that this recording does not follow (not that it has to). The casting of solo parts misses one of the big jokes in the play by having soprano Vivien Ellis sing the role of the queen. That the role was sung by a male voice seems certain, and the comic effect was probably heightened in the faux-solemn conductus that hails her arrival, identifying the cross-dressed actor as "prudens styrpe" (the chaste stem) and "haec virago" (that virago, or large, domineering woman). A similar ironic tone is heard in the conductus for the queen's exit. The choristers of Southwell Minster, where the recording was made, do an excellent job on the boys' parts, which do capture the likely character of the Beauvais original. At the end of play, which seems to coincide with the arrival of Christmas (or, rather, its octave), the Te Deum is beautifully accompanied by the bells of Southwell Minster. This may not be the version of the Ludus Danielis to own (more listening will be required for me to form an opinion on that matter), but with the above reservations in mind, it is a worthy adaptation.